The anti-Improvised Explosive Device (IED) is designed to clear un-exploded bombs and other explosives in the theater of combat. The Chief of Army Staff, Major-General T.Y Burutai and other top army officers were present at the unveiling. 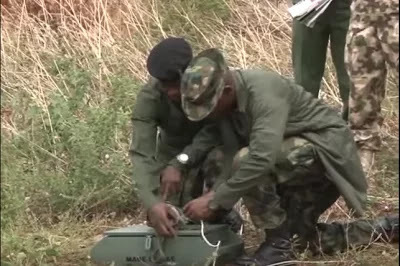 Defence College (NDC) and brain behind the innovation, Maj-Gen. Gabriel Ode, said the device was a product of research by the Nigerian Army Corps of Engineers. 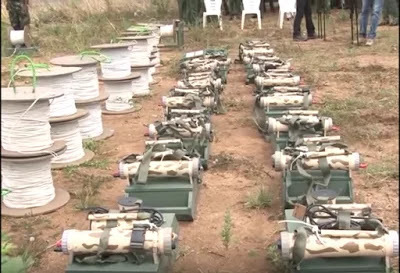 "Ode in his explanation to the COAS, Lt-Gen. Tukur Buratai and other participants at the conference who witnessed the testing, said the device could be used for demolition of Improvised Explosive Devices (IEDs) and unexploded bombs. According to him, the research on the production of this equipment lasted for four months while all materials used were sourced locally. “The importance of the device cannot be overemphasized because before now what was used in demolition of explosives were no longer useful and unserviceable. “We can use these ones in our operations in the northeast and the use of key switches makes it quite unique,’’ he added.